With a portrait of legendary goalie Jacques Plante hanging just a few feet away in the Canadiens locker room, Carey Price tried to digest what it meant to establish a team record. MONTREAL — With a portrait of legendary goalie Jacques Plante hanging just a few feet away in the Canadiens locker room, Carey Price tried to digest what it meant to establish a team record. 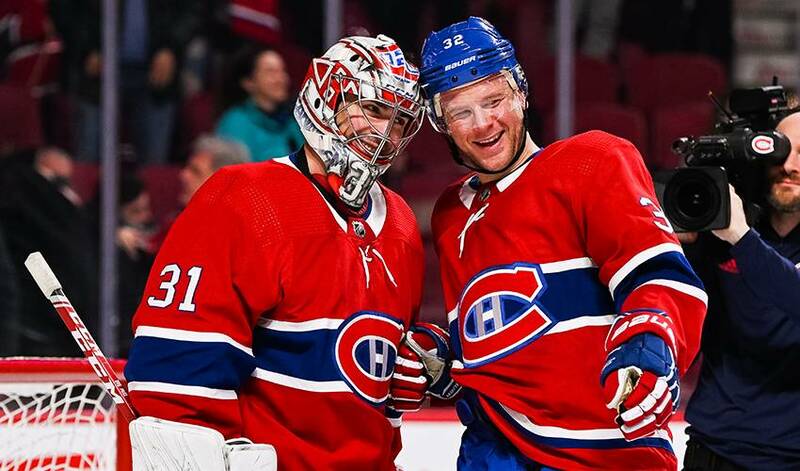 Price became the winningest goaltender in Canadiens franchise history on Tuesday following a 20-save effort in a 3-1 victory over the Detroit Red Wings. It was Price's 315th win in a Montreal uniform, surpassing Plante's 314-win record established in 1963. "I'm very proud obviously, first and foremost, to be standing here today with this puck in my hand," said Price, who earned his 29th win of the season. "I'm definitely thankful for all the help I've gotten along the way. There's been ups and downs throughout this whole process, and I've played with a lot of great guys and have played on some excellent teams. "I'll definitely have some time to reflect on it but I don't think that time is quite yet." Price, who was selected fifth overall by Montreal in the 2005 entry draft, improved to 315-221-67 all-time in 12 seasons with the Canadiens. Plante, who played for the Habs from 1952 to 1963, was 314-133-107 in his career in Montreal. He also played for the New York Rangers, St. Louis Blues, Toronto Maple Leafs and Boston Bruins before playing 40 games for the World Hockey Association's Edmonton Oilers in 1974-75. He had a 434-247-146 record in the NHL. "I feel like most people who have donned this jersey laid it all out there," said Price, reflecting on the Canadiens greats of the past. "I'm proud to be part of this." Price was instrumental in the victory over the Red Wings (24-36-10) as the Canadiens (37-26-7) snapped a two-game losing skid. Despite the win, Montreal (81 points) remains out of a playoff spot as both the Pittsburgh Penguins (83) and Columbus Blue Jackets (81) won on Tuesday to keep the playoff race close in the Eastern Conference. Price was on his game from the opening faceoff, stopping Andreas Athanasiou on the breakaway with a nice pad save in the game's first minute. With the game still scoreless in the second period, Price made a spectacular pad save on Michael Rasmussen before Shea Weber knocked the rebound away out of mid-air. Playing with a 2-1 lead with 12 minutes left in the third period, Price made his biggest saves of the night. The 31-year-old was fully outstretched to deny Tyler Bertuzzi on the breakaway with his toe before freezing the puck on Frans Nielsen's dangerous rebound. "He's the best in the world for a reason, he has been for a long time and he will be for an even longer time," said Max Domi, who scored twice, including an empty-netter. "It's honestly insane to put into words what he's accomplished. It's just another level." Tomas Tatar, who had two assists against his former team, agreed with Domi. "I'm really happy I can be his teammate and can be here for this accomplishment. He's one of the best goalies to have ever played the game," said Tatar. Domi gave Montreal the 1-0 lead at 12:27 of the second when he deflected Andrew Shaw's hard pass from the half-wall past Jonathan Bernier for his 23rd goal of the season. Brett Kulak made it 2-0 five minutes later with a one-timer through traffic that knuckled on Bernier and trickled past him. Athanasiou cut the deficit when he beat Price between the pads 40 seconds into the third period. Domi added the empty-netter with 49 seconds to play in the game. The Wings have won just once in their past 12 contests. "We had our scoring chances but Carey made some big saves in the third," said Bernier, who stopped 33-of-35 shots in defeat. "We had the chance to tie it up but we couldn't find the back of the net. Everyone knows it's hard right now. We can't buy any wins. But we have to stick with it. At some point you have to get rewarded." Notes: The Canadiens have beaten Detroit in nine straight contests. … It was the last of four meetings between the Canadiens and Red Wings this season. … Dylan Larkin (neck injury) missed his fourth straight game.